Just wanted to with everybody a Happy Easter. Here are some Easter Tulips on display at Watanabe Floral. 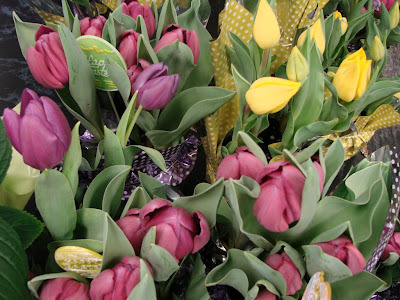 Tulips are spring-blooming perennials that grow from bulb. These are very commonly display and gifted to brighten somebody’s Easter. I took this photo on Bob’s Dowsett Avenue Full Moonwalk last weekend. 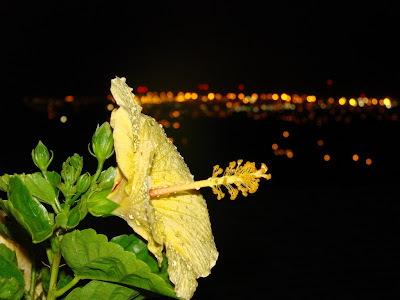 We paused to look at the city lights and one of my friends suggested taking a closeup of the flower with the city lights in the background. After many attempts here is what I cam up with. I like how the flash nicely lit the flower and even the raindrops on the blossom. In the background you can see the downtown Honolulu city lights. We end our Honolulu Museum of Art School series on “The Splendors of Ikebana” with this piece entitles “Floral Symphony” by Elaine Arita “Horen” from the Ohara school of ikebana. Accomplished ikebana artists get a teaching type degree and a name which for Elaine was “Horen” This was just a small sampling of Ikebana and there are many modern styles as well as classical styles of the art. 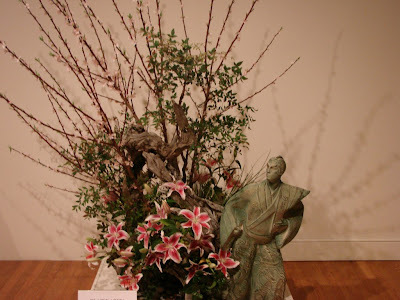 To learn more check out the Ikebana International Honolulu chapter 56. They also have many exhibitions and classes in learning the craft. I hoped you enjoyed this series and also learned a little about the artform of ikebana.